F. Serafino, C. Lugni Claudio; J.C Nieto Borge et al., “A Simple Strategy to Mitigate the Aliasing Effect in X-band Marine Radar Data: Numerical Results for a 2D Case”, Sensors , vol.11, pp.1009-1027, 2011. F. Serafino, C. Lugni, and F. Soldovieri, “A novel strategy for the surface current determination from marine X-band radar data”, IEEE Geoscience and Remote Sensing Letters, vol.7 n.2, pp. 231-235, 2010. 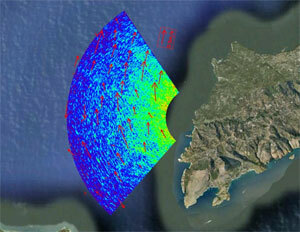 F. Serafino, C. Lugni, J. Carlos Nieto Borge, V. Zamparelli, F. Soldovieri, "Bathymetry Determination via X-Band Radar Data: A New Strategy and Numerical Results", Sensors, vol.10, n.7, pp.6522-6534, 2010. F. Serafino, C. Lugni, F. Raffa, F. Soldovieri, “Ocean Surface Current Determination from Marine X-band Radar Data and Wave Height Reconstruction”, EGU, 19 – 24 April 2009, Vienna, Austria. F. Serafino, F. Soldovieri, C. Lugni, "Sea-State Monitoring via X-band Marine Radar Images Sequences: a new Approach for an Accurate Surface Currents Estimation”, OMAE 2009, Honolulu, Hawaii, 31 May - 5 June, 2009. F. Serafino, C. Lugni, and F. Soldovieri, “Sea Surface Currents Estimation via X-band Marine Radar Images Sequences acquired from a moving vessel”, OceanSAR 2009, 7-11 September 2009, Herrsching, Germany. F. Serafino, Francesco Soldovieri and Claudio Lugni “Aliasing effect removal in sea height reconstruction by X-band radar images acquired from a moving vessel”, OceanSAR 2009, 7- 11 September 2009, Herrsching, Germany. F. Serafino, C. Lugni, and F. Soldovieri, “Sea Topography reconstruction from X-band radar images”, Advances in Geosciences, vol. 19, pp 83-86, 2008.